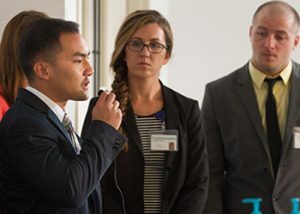 A neuromuscular course recently led students to present on innovative topics, including the use of Xbox Kinect and virtual reality for participants with Parkinson’s disease, and the use of mental imagery for a participant with a chronic brain injury. Physical therapists are responsible for providing much more than assessments and treatment plans—they must also dive into the research to apply evidence-based, individualized care to improve patient outcomes, which is especially important for patients who present neuromuscular conditions. To help prepare Doctor of Physical Therapy (DPT) students for their responsibilities as practitioners in these scenarios, assistant professors Dr. Lindsay Perry and Dr. Anne Boddy recently added an immersive Patient Oriented Integrated Neurological Treatment (POINT) Lab (following the framework established by Dr. Anna Edwards in 2010 on the San Marcos campus) to the Neuromuscular III: Advanced Evaluation & Interventions course during their fifth trimester on the St. Augustine campus. A fundamental component of the POINT Lab is the research that each student team must complete and present as part of their case study at the end of the course. 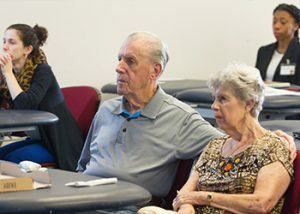 Students researched an array of topics for participants with Parkinson’s disease, including the use of dance, boxing and agility training, the implementation of virtual reality or Xbox KINECT, transcranial magnetic stimulation and treadmill training, and vestibular rehabilitation. Other student case studies addressed the efficacy of treadmill training for post-subacute stroke, and the use of mental imagery for chronic traumatic brain injury. Not only did this assignment help to prepare students for their seventh and final trimester, which will require them to complete a patient case report, it also begins familiarizing them with the ongoing research they’ll be expected to complete once they graduate. “As practitioners, they should always be asking questions that lead to research that may positively impact the outcomes of their patients,” Dr. Perry said. What’s more, it also leads to more engaged practitioners who inherently collaborate and actively present their work at professional conferences. Students presenting “Dance Therapy and Parkinson’s Disease. 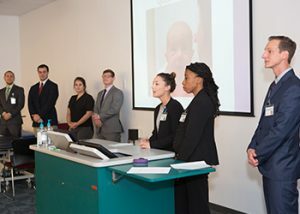 Many of the POINT lab participants attended the students’ presentations. 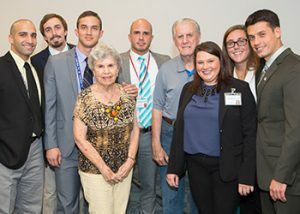 Russ Patti, Nolan Beede, Huvert Rodriguez, Ramon Garcia, Jessica Mentrup, Jessica Stoll and Peter Rodriguez (from left to right) shown with the participant, Lourdes Brenick and her husband, George Brenick. 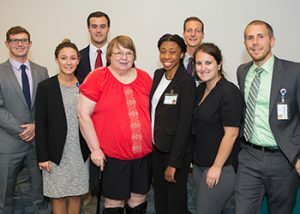 Tyler Hughes, Meghan Gendzier, Jeff Jenkins, Kristen Duncan, Brent Yoder, Michelle Maracle and Chris Lester (from left to right) shown with the participant, Janice Mariotti. 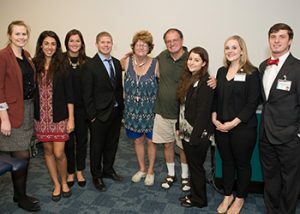 Julia Wyatt, Emily Moss, Alyssa Kelly, Greg Bender, Kristin McClelland, Kelli Hansen and Tyler Hudgins (from left to right) shown with the participant, Kevin Quealy and his wife, Margie Quealy. 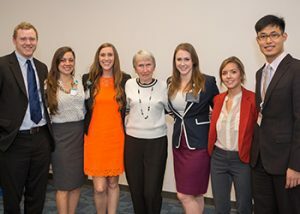 Phillip Hebert, Adrienne Carriere, Mackenzie Matheny, Andie Bradford, Alexandra Allen and Chin-Hueng Tseng (from left to right) shown with the participant, Jane Collins. 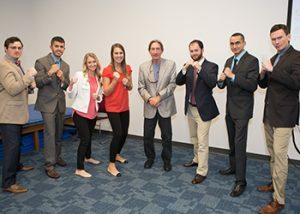 David Hall, Cameron Chiesi, Kelly Hamilton, Stephanie King, Robert Dodson, Faiz Habashy and Jacob Groseth (from left to right) shown with the participant, Dennis Applegate.